Welcome to Distant Horizon's Gaming Corner. Here I hope to provide you with information and media concerning the Avatar video games. I'm still fixing some of the pages, but information, guides, and more screenshots have been added for the first Avatar game, The Burning Earth, and for the upcoming game Into The Inferno which will be released October 13 for the USA, October 23 for Australia, and December 31 for the UK. The second in the Avatar video game series, titled "The Burning Earth", goes on sale today! General information on the game and detailed information on the Flying levels is up, as well as some screenshots, trailers/video clips, and other media. Links to guides and help faqs will be added as they become available, but right now there are a few cheat codes listed. 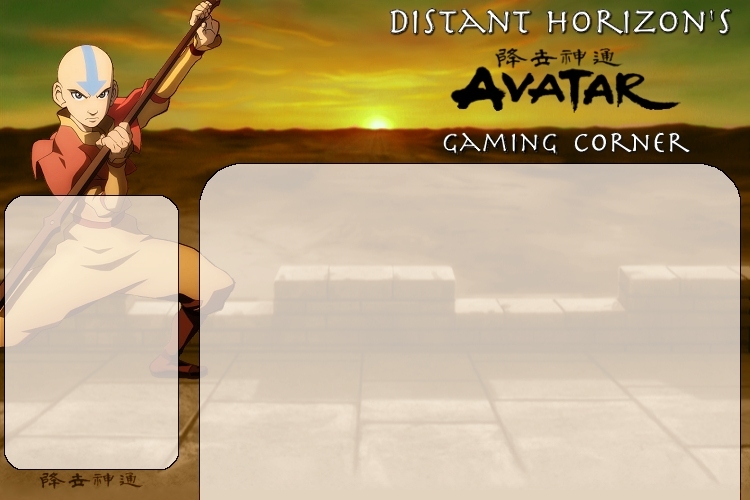 I haven't added information and media for the first Avatar video game yet, but I hope to have that part of the site finished later this week. Avatar: The Last Airbender was created by Michael DiMartino & Bryan Konietzko, and is owned by Nickelodeon & Viacom. The video games were created and published by THQ. This site is maintained by Jade, and is a part of Distant Horizon.